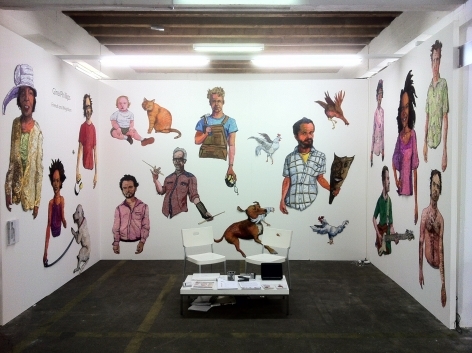 JONATHAN FERRARA GALLERY is proud to announce that the gallery will present Friends and Neighbors, a solo installation of new fabric portraits by GINA PHILLIPS at the VOLTA 8 Art Fair in Basel, Switzerland June 11-16, 2012. Jonathan Ferrara Gallery is one of only eight US galleries out of 85 International galleries selected to exhibit at this year’s Volta Fair in Basel. 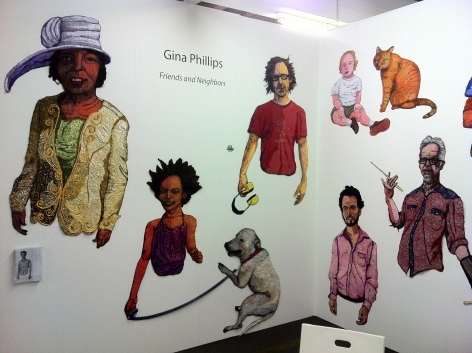 GINA PHILLIPS is a mixed-media, narrative artist who grew up in Kentucky and has lived in New Orleans since 1995. Her work is influenced by the imagery, stories and characters of both regions. She started her career as a painter, but over the years, has increasingly incorporated fabric and thread into her work. She begins a piece with a simple underpainting in acrylic paint on canvas or muslin…then finishes the piece by appliquéing fabric and thread on top. Phillips uses a communal gathering process to source her fabrics, as neighbors, friends, family often donate to her artistic process. Her sewn work hover between two and three dimensionality and often the backs of her pieces are as interesting as the front sides. The most common narrative characteristic that runs through her work is tragicomedy. The people and/or animals that tell the story often embody a magical realism. Phillips creates ethereal “cut out” portraits from found and gathered fabrics. Inspired by the work of Alice Neel, her cut-out figures emanate a strong presence as the viewer is bound to feel like they come to know the person over time. The truncated forms however impart an air of vulnerability or disenfranchisement . 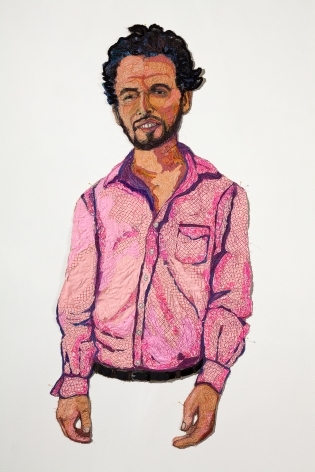 Friends and Neighbors is a continuation of a series of fabric portraits by Gina Phillips that utilize people from her Lower Ninth Ward neighborhood in New Orleans. 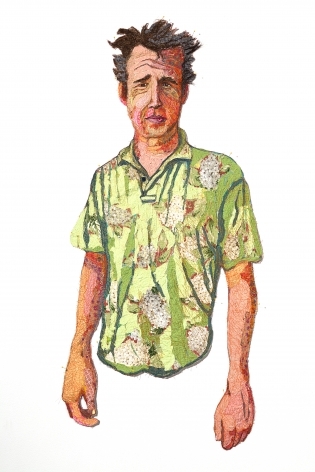 The first suite of these portraits were presented at the Pulse Contemporary Art Fair in Miami in 2011 where they were acquired by several noteworthy collections. 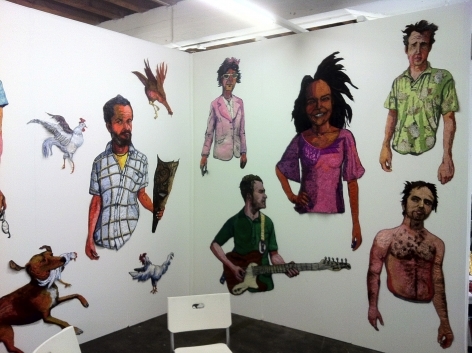 All the portraits in this show are people I know…mostly my neighbors in the Lower Ninth Ward neighborhood of New Orleans. I begin by photographing the subject multiple times. Then I sketch from the photos, sometimes combining elements of several photos into one sketch. After the sketch is complete, I trace the drawing onto a transparency and blow up the figure using an overhead projector and then I redraw it on a piece of plain muslin. At this point, I use acrylic washes to complete an underpainting. 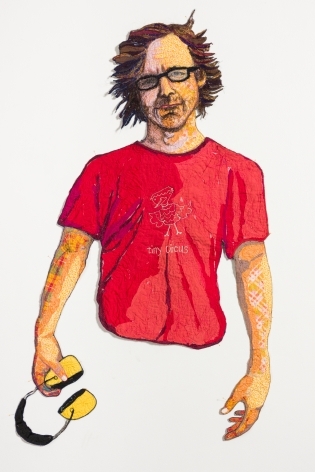 After this is dry, I load the piece onto a long-arm quilting machine and begin the process of appliquéing various combinations of fabric, thread, yarn and hair onto the portrait. I use the underpainting as my guide for form, light and shadow, and color choices. I use the long-arm quilting machine as a free-motion, thread-drawing machine. After rendering the figure with fabric and thread, I cut it out of its background and pin it to the wall. There’s an interesting dichotomy between the vulnerability of these truncated forms and the strong presence they emanate that speaks to the human condition. More than anything, in each portrait, I try to capture something of the essence of the person. 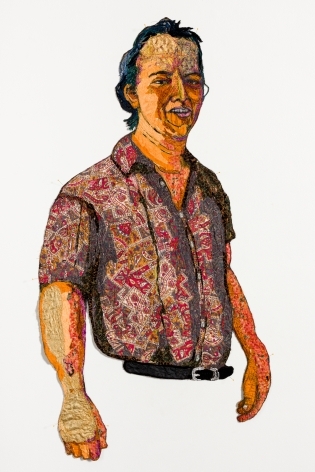 Living with these fabric portraits, over time, the collector is bound to feel they come to know these characters. 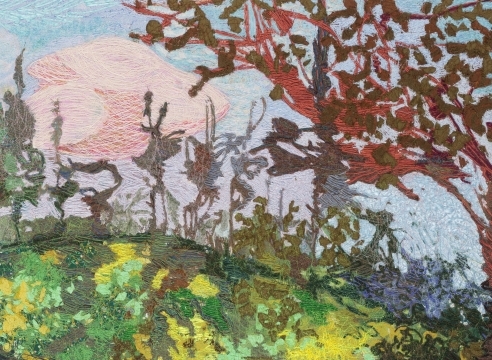 Phillips’ work has been exhibited in galleries and museums across the country and her work is in numerous collections including University of Kentucky, Lexington; NASA; New Orleans Museum of Art; the Ogden Museum of Southern Art; the Frederick R. Weisman Art Foundation; the Collection of Marilyn Oshman; Tulane University; The House of Blues; 21c Museum, Kentucky; and the Drake Hotel, Toronto She was a featured artist in Prospect.2 Biennial with her exhibition “Life Lasagna” at the Contemporary Arts Center, New Orleans. She is scheduled to have a mid-career retrospective at the Ogden Museum of Southern Art in 2013 and a solo exhibition at the Birmingham Museum of Art in 2014. 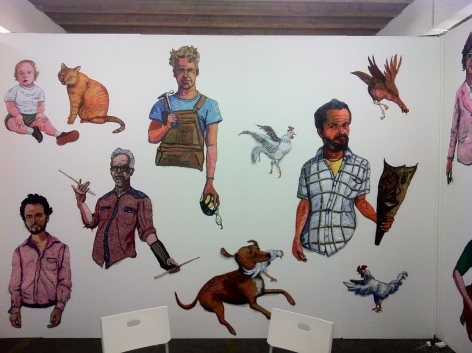 Jonathan Ferrara Gallery is a collective environment of creative visions: a commercial gallery with a public conscience. Artist, activist, and entrepreneur Jonathan Ferrara opened the gallery in 1998 to give artists a greater voice. Since its inception, the gallery has focused on cutting edge works by local, national and international artists with a sense of purpose, mission, and message. The gallery produces monthly exhibitions and does art fairs including PULSE in Miami and LA and Volta in NY. The exhibition will be on view from June 11th through June 16th at Booth B14 VOLTA 8 / Dreispitzhalle / Helsinki Strasse 5 / CH-4142 Münchenstein/Basel / Switzerland.